Conventional wisdom says dark trousers and a light shirt. Hollywood says wear all black. Turn both on their heads. For a summer evening, try white trousers (hey! it’s summer, you can’t wear these after Labour Day) and a dark shirt. 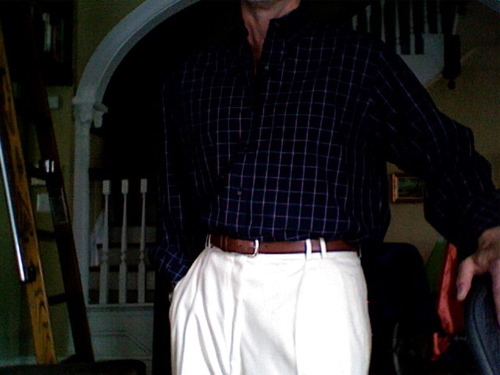 White, lightweight wool pleated trousers (lined to the knee in muslin — or they’d be see-through), tan calf belt, dark blue shirt with white windowpane overlay by Brooks Brothers (ca. 2000?) Spectator or light brown loafers (although I usually wear black shoes in the evening) continue the evening’s palette. I have seen this work very well with navy Belgian slippers. Finding a blue leather belt can be difficult, however. Have a swellegant weekend. If you are in the metro D.C. area, don’t forget about the Doc Scantlin Dancin’ under the stars concert at Reston Town Center. Wear your white dinner jacket. This entry was posted in Elegantology and tagged clothing, evening, Friday casual, summer. Bookmark the permalink. Refined, stylish, classy and elegant. I don’t know many guys nowadays whom I can describe as “debonair” except you. Who said only Italians know about clothes! I love nothing more than a guy who knows how to dress. You have such a great taste. It’s a great blog, by the way. Thank you very much, G. Morien-Jones. And welcome. I’m glad that you are enjoying the bog. Please let me know if there is a topic you’d like me to try and cover. Italy, by the way, is the only country I’ve visited in which I felt underdressed. La bella figura is alive and strutting. The trousers are crisp and classic, perfect for a balmy summer evening. Would also love to see them with a navy leather belt, as per your suggestion. And love your new header, by the way. Have a great week, Elegant.